I know that you've probably all seen this dress before but I love it so much, that I had to have another outfit post about it. I wore it yesterday, to a pretty busy day. I spent the morning at a Press Day and then spent the rest of the day with one of my best friend (she's the type of friend that I can be a complete dork with and she'll act the same: see photo's below!). I'm also wearing purple tights. I've never worn tights that weren't black or clear, so this is a nice change. I think I may have to invest in more tights soon as well. And I was also sent this gorgeous necklace from EclecticEccentricity Jewellery. Isn't it beautiful?! 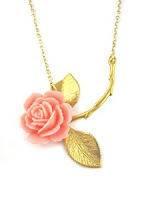 It's called the 'Where The Wild Roses Grow Necklace'. 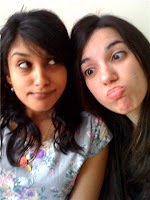 Me and my friend: Turns out we're incapable of taking normal pictures! P.S. I apologise for being MIA in the blogisphere lately. I'm also completely out of it these days! I picked up an awful bug last weekend, and it only just seems to be getting better, so I spent loads of days in bed. And with the General Election being around that corner, I'm also in full political mode. Oooh I love those purple tights with that dress. And that necklace is so lovely. Such a lovely day dress! Perfect for spring! I keep telling myself to invest in colorful tights as well. Such a great alternative to black! That dress is so beautiful! Especially the back detail. Loved that you paired it with purple tights! Looks adorable. And haha that's how my friends and I act with pictures. And I'm glad you're feeling better! Such a pretty spring dress! Dear, love the wacky faces. Hehehe...so cute! You lovely in that floral dress btw. You should show off that dress more! it is super gorgeous! Beautiful dress, I love the back of it! That dress is so beautiful - especially the back - and I love your necklace! Sherin, you look gorgeous! I love that dress on you. ehat a cute floral dres..
it looks fab on u dear..
You look gorgeous with florals!!! Hope you get better soon Sherin. The dress is wonderful and I love the cutout effect on the back. The pastel shades are bang on trend too. And gorgeous necklace!!! love the back of it! 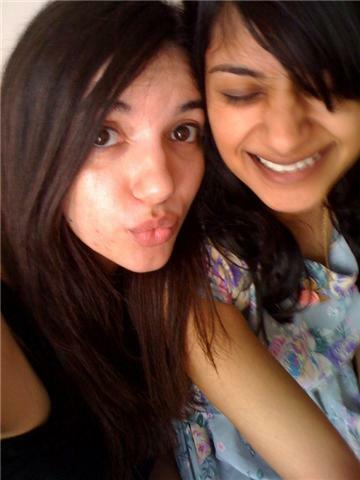 Hey Sherin! Sorry to hear you weren't feeling well! I hope you continue to feel better! I'm also so glad that you posted this dress again! I love this dress!! The back is amazing and you look gorgeous in it!! The necklace is super cute, I wish I would get things sent to me as often as you do! lol Very lucky! And you and your friend look so cute together! It's always good to have friends you can truly be yourself around!! That is such a sweet dress! Love it.. and with the necklace is even sweeter. Hope you feel better soon and good luck with the election! I love this style of dress eg. floral print, cut out detail, 50s shape and the purple tights are a great contrast. Once you start experimenting with tights, you can never go back! Get well soon. Fantastic dress, you look beautiful! So cute, the dress is grogeous, definitely worth a lot of outfits! So spring-like and pretty! Aww I hope you're feeling much better now! Sherin - I hope you are feeling better. :) Your florals are so pretty, I love florals this weekend!